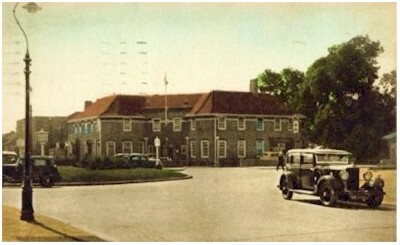 Planned in 1931, a new pub to be called the Elm Tree Hotel was to be sited at the junction of Goring road and George V Avenue. 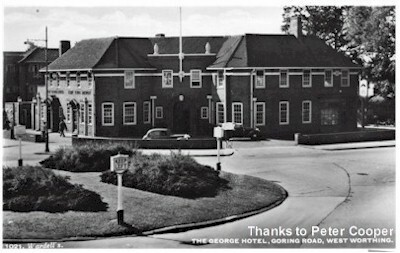 It was built around 1935 and opened in time for King George's Jubilee, hence the name change. 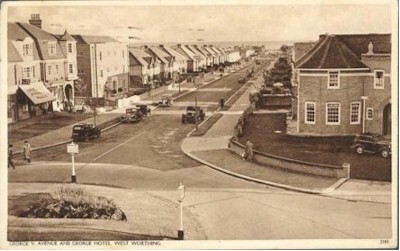 It was positioned to make the most of the growing population seeking housing outside the town and to catch travellers coming in. The new entrance was added in 1990. 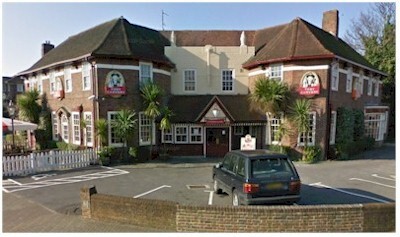 Latest 'old' picture of the George taken a couple of years after the one above. (there's an extra lamp post). Most of us who are of 'an age', will always know this pub as the George, but the younger population simply know it as the Toby Carvery, a chain pub managed by Mitchells & Butlers. In fact, there doesn't appear to be any name displayed on the building.